Spread the word mums.... for each friend you recommend to Brilliant Bilinguals that registers for the term, you'll receive one free session next term! Brilliant Bilinguals hold popular musical, sing-song, action-packed, SPANISH children's sessions throughout Ewell and Motspur Park. These are like nothing you’ve ever experienced before. Sessions are led entirely in Spanish, by qualified, native Spanish primary school teachers. Sessions led entirely in Spanish, by qualified, native Spanish primary school teachers. Sessions separated by age for babies, toddlers, preschoolers and primary school children and led by qualified native Spanish primary school teachers. 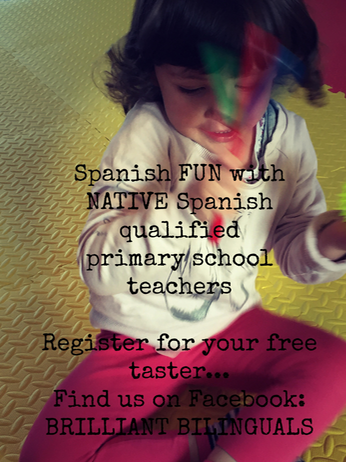 Find us on Facebook under�Brilliant Bilinguals�to register your attendance at one of our free tasters. Places limited. First come, first booked.